We slept in pretty late after the adventures of yesterday. 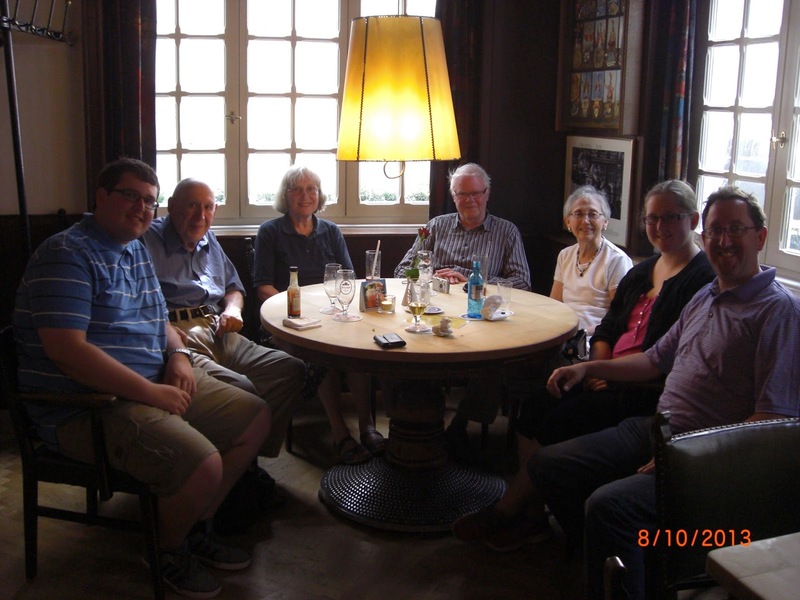 Our friends in Münster, Gertrude and Werner Althoff, were set to meet us for lunch at 12:30, and we barely got out of our hotel in time. Gertrude Althoff is very involved in her local church, where she serves as a historian about the Jews in the area who were killed or left during the Nazi regime. She originally lived in Rheine, my grandfather's hometown, which we'd be visiting the next day. 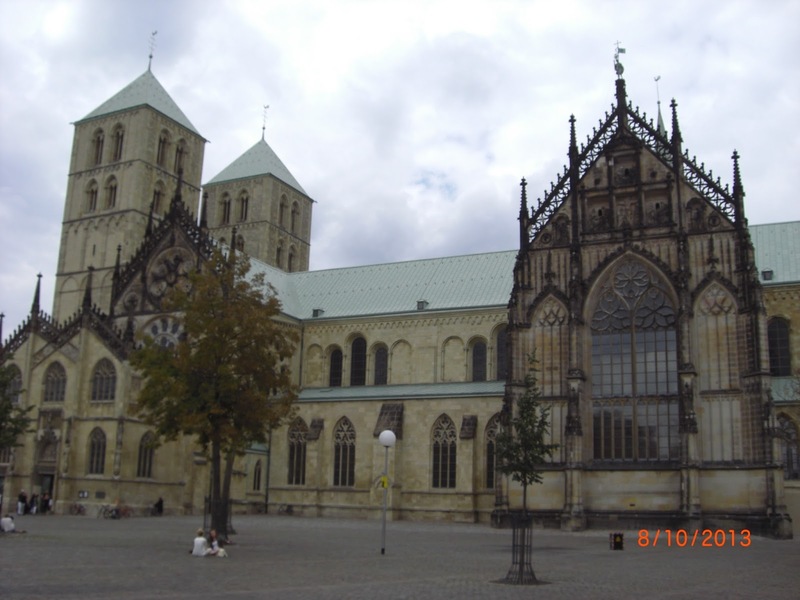 Gertrude is an expert about the history of Jews in Westphalia, the area which holds both Münster and Rheine. So we met Gertrude and her husband Werner for lunch at a restaurant near their church. It was an authentic German restaurant; you could tell by the building it was in, and by the clothes the waiters were wearing. I ordered a Rolinck Pilsener, a Westphalian beer that was probably the best of the trip. For lunch, I got a "Strammer Max," and no, not just because of the name. The "Strammer Max" is a piece of bread with butter, cheese, Westphalian ham, and a fried egg on top. A Westphalian beer and Westphalian ham, I almost felt like my Westphalian ancestors did. When we finished up with lunch, the Althoffs took us on a short tour of the city of Münster. 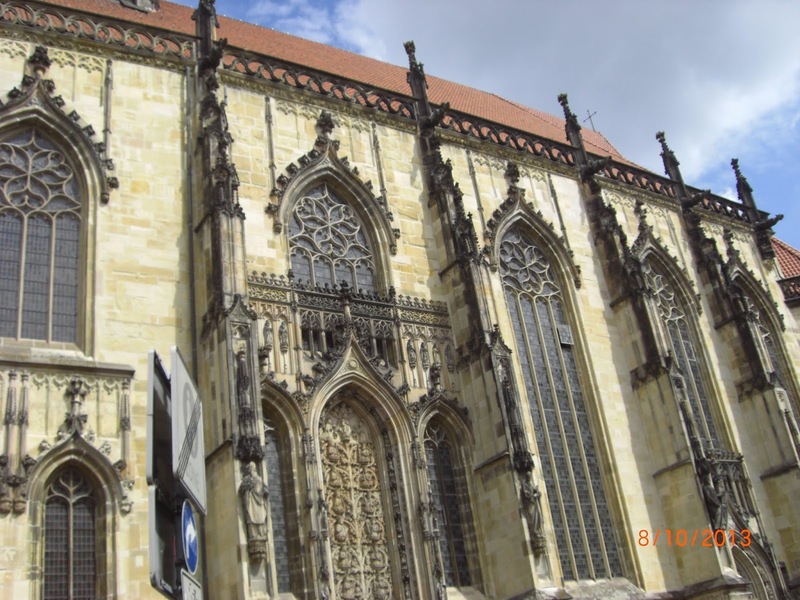 The tour included a nearby church, where the treaty was signed to end the Thirty Years' War back in 1648. We walked around a few more of the many churches in Münster, all with incredible architecture. It was especially cool because we were doing it on a Sunday. We continued walking, eventually leaving Opa and Gertrude behind to look around on their own, and went to visit other places around Münster. 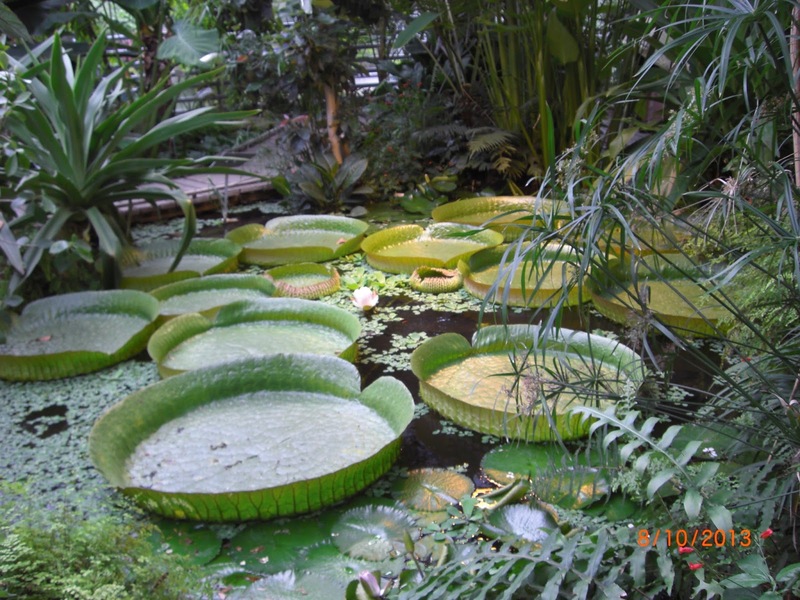 There was a botanical garden that was in use for the nearby university's biology students. Eventually, we met back up with Opa and Gertrude at a cafe that overlooked a river. The area around the river reminded me a lot of the Inner Harbor in the way it was set up. Anyway, we all got coffee and cake. I got a pretty good slice of apple pie. We talked for a while as we ate, and then began making our way to the Althoffs house as rain began coming down from the sky. We got to their house virtually unscathed by the rain and had some dinner later on with a beer. Werner downs beer like it's water, pretty incredible actually. The thing we started to figure out as we had meals with the Althoffs is that Germans eat a lot of bread. Like, a lot. We left to go back to the hotel after dinner. The only channel in English is CNN, so we ended up watching the German version of America's Funniest Home Videos. That stuff is funny in any language.